The heart is a specialized muscle that contracts regularly and continuously, pumping blood to the body (via the left ventricle) and the lungs (via the right ventricle). A heart attack or myocardial infarction results from insufficient supply of oxygen-rich blood to the heart muscle. Blood is supplied to the heart muscle by the coronary arteries. Some persons may experience coronary artery disease (CAD) where the arteries become blocked by a buildup of plaque consisting of fatty deposits, calcium and proteins in a process known as atherosclerosis. When atherosclerosis occurs the arteries become narrow and restrict the flow of blood from the arteries to the heart. Some heart attacks are sudden and intense but most heart attacks start slowly, with mild pain or discomfort which means that persons may not know right away that they are having a heart attack. Discomfort in the center of the chest that feels like pressure or squeezing and lasting longing than a few minutes can be an indication of an oncoming heart attack. Discomfort or pain in other areas of the upper body such as the arms, back, neck, jaw or stomach, shortness of breath, cold sweat, nausea or lightheadedness are also signs. If one or more of the coronary arteries are blocked by plaque, the blood supply to the heart muscle is reduced or stopped. If a plaque should burst, tear or rupture a blood clot may form, completely blocking the artery and blood flow to the heart muscle. After a few minutes the muscles may become permanently damaged, die and lead to a heart attack. Each coronary artery supplies blood to a region of heart muscle. The amount of damage to the heart muscle depends on the size of the area supplied by the blocked artery and the time between injury and treatment. There is also the possibility of a heart attack resulting from a spasm of a coronary artery. Coronary artery spasm also known as vasospasm causes the affected artery to briefly narrow which obstructs the blood flow to the heart. The spasm can affect persons suffering from atherosclerosis or persons that have a normal coronary artery. 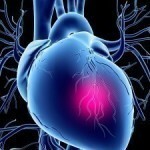 Coronary artery spasm may also cause variant angina pectoris which is a squeezing, suffocating or burning feeling in the chest. Variant angina commonly occurs during times of rest; persons with this condition are at a greater risk for heart attack and even sudden death. There are other heart conditions that can lead to a heart attack. These include coronary heart disease, (previous) heart attack, cardiovascular disease, pulmonary heart disease and angina. Factors such as poor diet, lack of exercise, obesity and smoking can lead to a heart disease and ultimately a heart attack.